This is a page to hold my Audioblogs and Blog from Comic-Con 2004. 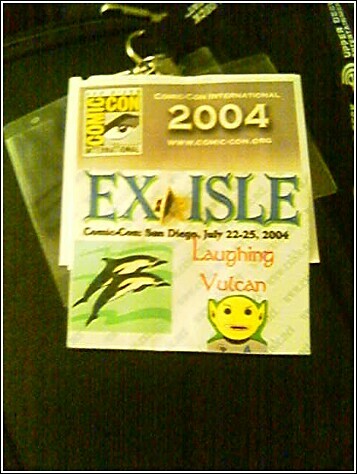 It was created Saturday, July 17th, 2004, six days from the “official” start of ExIsle’s presence at ComicCon. All of the Audioblogs are in simple .wav format. Broadband is highly suggested for them. If I find a way to convert it to a less hoggish format I will. I did find the minimum settings. The audio got much more grainy, and there's some static in them that is just my Tablet PC operating, but now the 100 second ones are a little under 1 MB. I'd recommend the "save to disk" option to save my bandwidth, but neverthestill, my bandwidth is OK right now. Another note: My final audioblog has been posted here. Images, and other stuff will be soon coming. Please check back again! End Of Line. Blog follows. 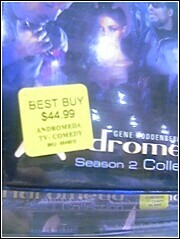 Blog # 20 - And fun at Best Buy! OK, so best buy really did a nice thing for me, and I don't want to insult them in any way, shape, or form. Blog # 19 - Never Say Never Again, LaughingVulcan! Audioblog can be found here. Type: Audio - Note: The audio from the room really didn't come out as I liked. Right now my microphone settings are meant for dictation with the mike right next to my mouth... I should and will find some way to make it better if I can; I'll do better on it next year. Now, as I recorded earlier, there were introductions of all these people. But I couldn't place anybody except Nikki (since I saw her pic on the board before leaving.) So, if you can help me identify these poor EIers, please drop me a PM on the board! Thanks! 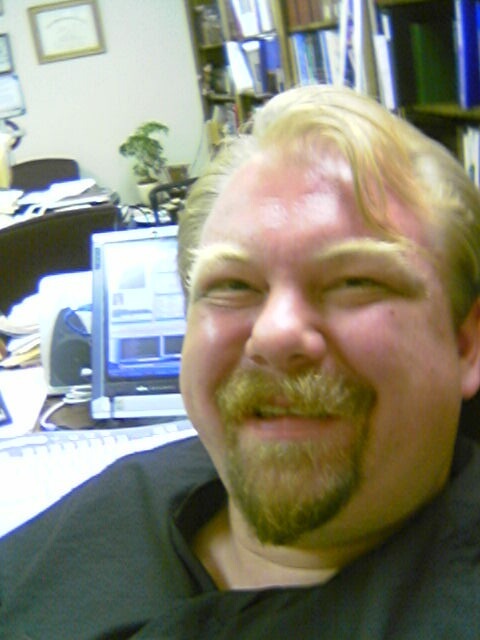 This is Laughing Vulcan with another audio blog. You might ask, “What do you mean by audio? This is typewritten!” Yes and true. But, this particular blog is being dictated by my voice into my tablet as I drive. It takes some skill, but is very easy to master. Having something useful to say is another matter. 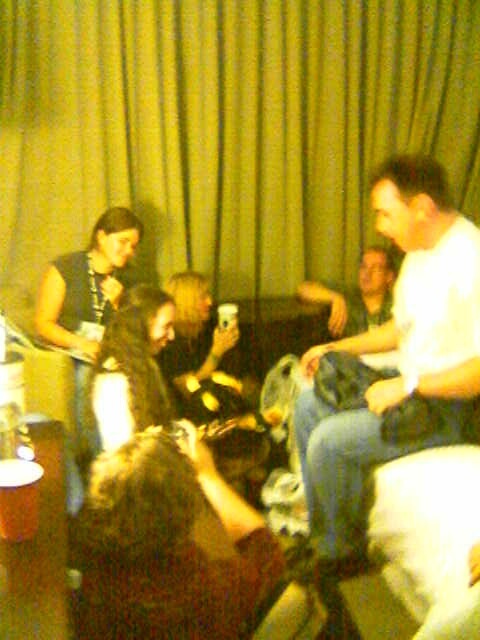 I am traveling from Escondido two San Diego to meet up with any Exilers’ who are still partying at about eleven P. M.. One strange thing about Comic-Con is that while many are online all throughout the night, the con can be so exhausting that it is hard to stay up late. Another problem is for those of us staying at another hotel. Parking around the Westin is not easy to find. So, we might feel a little limited. If you plan on attending next year, make your reservations early to stay in the hotel where most of us will be, or stay in a nearby hotel. After this weekend I will look into posting a list of hotels in nearby the convention center within easy walking distance, even though I think it was done this year. I live only three hours away from San Diego. I am a frequent visitor to the beaches (east beaches are the holiest places on earth to me.) Most frequently I stay in Hotel Circle, about fifteen minutes north of downtown by car – not walking distance. This year I lucked out because my sister was coming into town. Her company is based in San Diego. So I grabbed a piece of her floor. Next year I will probably be staying in a hotel. Be warned: my snore sometimes reminds people of Grendel’s battle cry. I do not make a good roommate. Just for reference, this is about fifteen minutes of dictation. It may not seem like much for so small a time -- I could make a much longer audio blog -- but this is in some ways more fun and easier to do while driving. Another thing to note is that while we calm here for comic con, there is a lot more to see in the San Diego area –and not just when a new aircraft carrier is being commissioned. San Diego is also the home of the Sea World center, Padres baseball, and fun beaches. 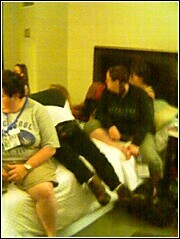 Many arrive early and stay later than the con. I would recommend planning a vacation in San Diego to include more than just the con. I am really just filling space at the moment during my 30 to 40 minute drive back towards downtown. 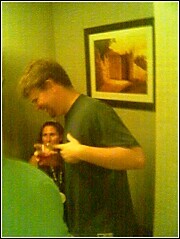 When I get close enough I will abruptly end this entry in order to call Rov. One saying that I just realized is how much this is like the old way a commander Adama used to make log entries on the spelling mode Battlestar Galactica. It is only a little slower. Some writer or creative producer should be given credit for anticipating a technology 25 years ahead of its time. 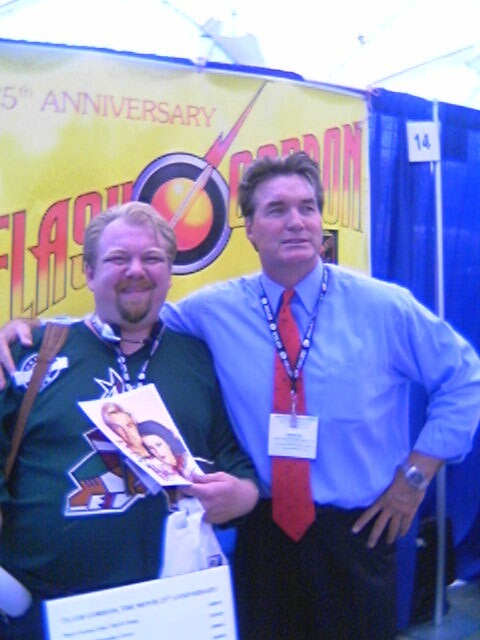 Next time I see Richard Hatch I will have something to tell him! On more of a personal note, I must remember to give us some shameless plugs to some of the companies and people that I have seen here. But I will write the shilling blog at some other time. 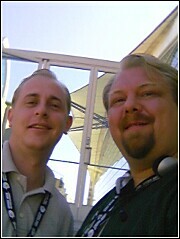 This really belongs to an earlier audioblog, but it's Kevin and I relaxing on the steps before separating for the last time at Comic-Con. 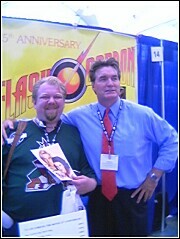 Me with Sam J. Jones; sorry but I was too awed to take one of me and Richard! The pics I had autographed, framed, ready to be put in a spot of honor! 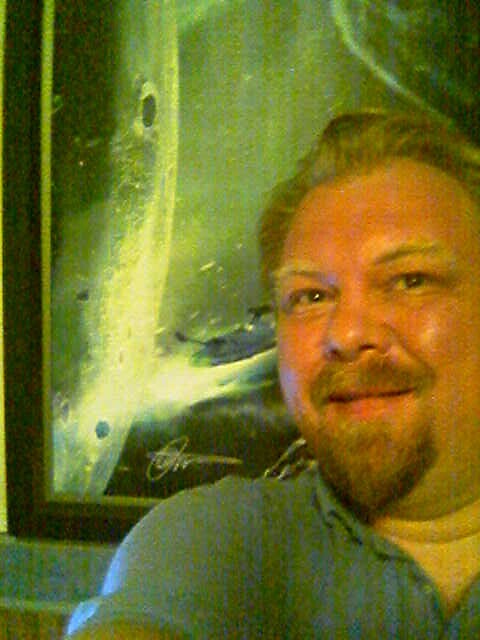 Me in front of (part of) the giclee I bought, chronicled in Blog #13. 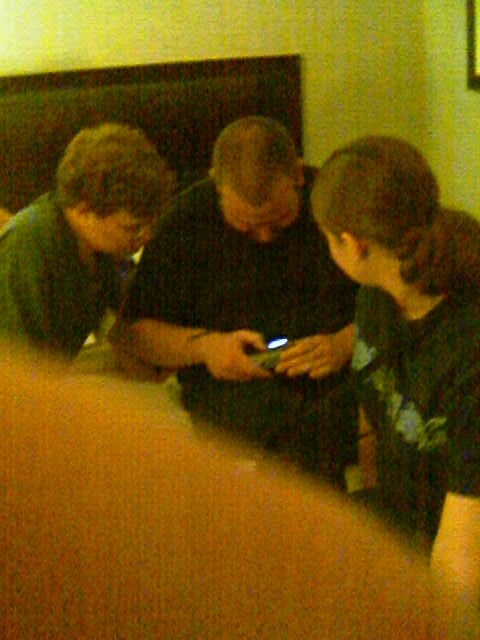 My camera is a little off color because of the yellow light, but it's pretty cool. And Big! 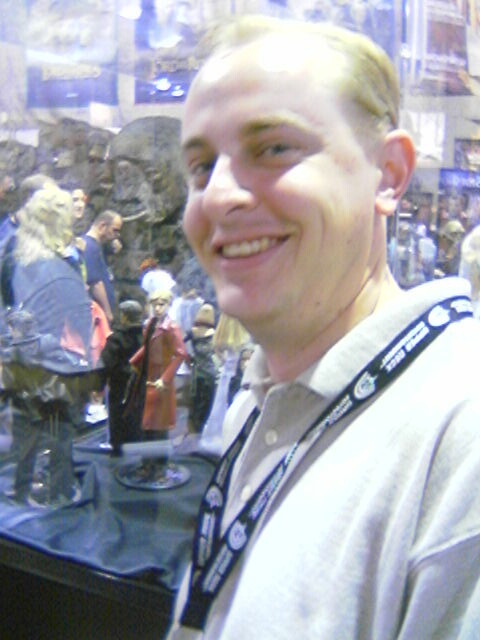 Kevin (a major Buffy fan,) posing next to the Buffy figs on the exhibition floor. 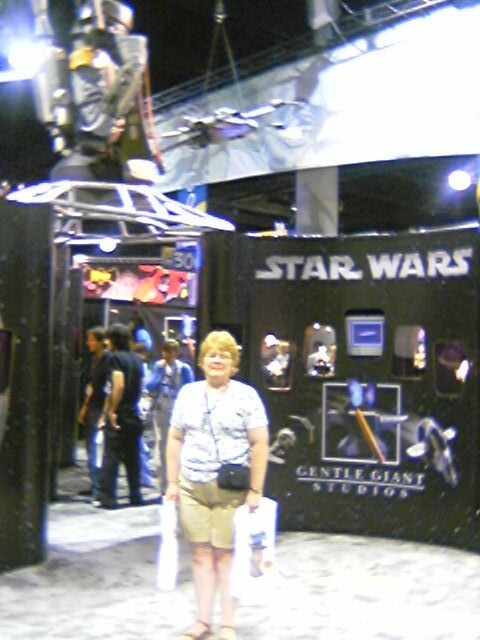 Heidi (my sister,) posing earlier in front of the Star Wars exhibit. 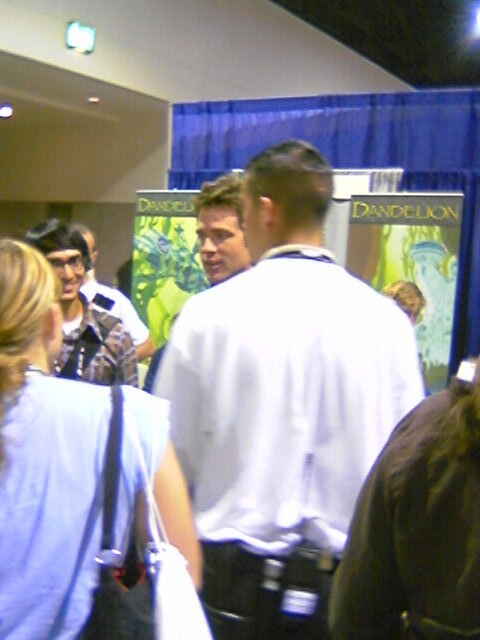 Ben Browder in profile, half cut by a staffer's face and arm. Sorry, my Claudia pic was too blurry. Yep. 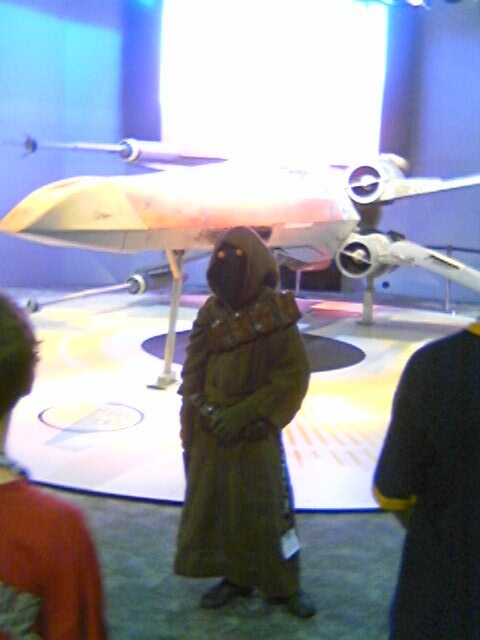 It's a Jawa. Yep. It's an X-Wing. 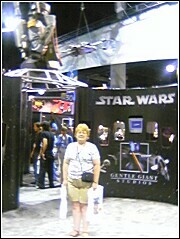 Nope, I didn't get an Ep III T-Shirt nor a pic of one. Blog # 6 - Have we not heard the bells at midnight? 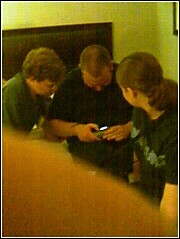 Stardate: July 24, 2004, midnight. 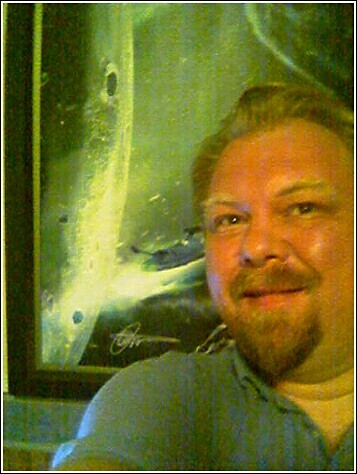 Stardate: July 23, 2004, abt. 7:15 pm. No, no joke. I actually left Yuma without a) my shirts and pants for the weekend, b) my cat-5 cable (didn't need it, fortunately) c) directions to the hotel. It was either that or be trapped in Yuma. 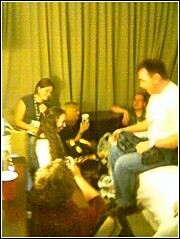 So you get this audioblog from the road to the Westin Horton. Blog # 3 - Early in SD? parisindy on the way, jon's commendation. Mainly, I wanted to say just how addicting audioblogging can get. I suspect that, despite the poor audio quality and high file sizes, that I'll be doing my blogging from the con using audio. Also, it's a little slow to relay info that way. In 100 seconds I said that G1223 is our Advance Guard (Early in SD? Contact G!) and that parisindy is on the way, and that I admired jon3831's "taking SD" post. Anyway, this is my first mixed blog. If I were using Blogger you could comment, but instead just PM me on ExIsle and I'll happily repost them here. Live long and prosper! Blog # 2 - Who's already in SD, and where we're meeting on Friday - cont'd from last. Blog # 1 - Mainly a test audio. 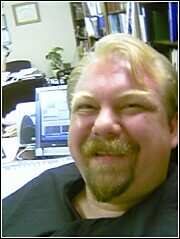 Yep, this is me on the Sunday before Comic-Con, testing my picture phone. 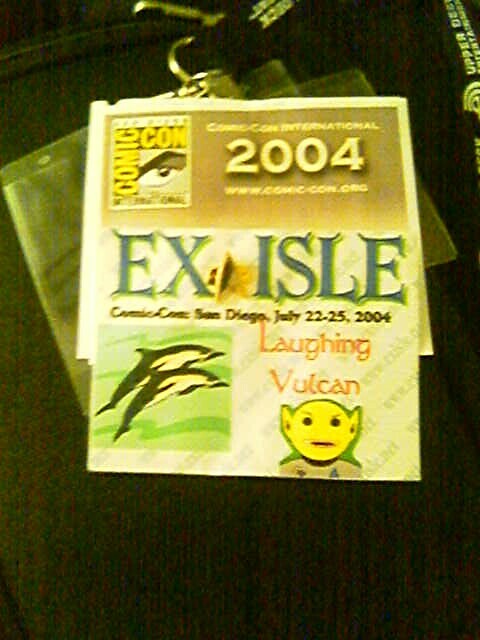 The ExIslers gear up for Comic-Con 2004!